Boundary|Time|Surface was a site-specific ephemeral sculptural installation that took as its basis the internationally recognized designation of the geological boundary between the Cambrian and Ordovician periods at Green Point, Newfoundland. Stratigraphic Column adapted from: R.A. Cooper, G.S. Nowlan, and S.H. 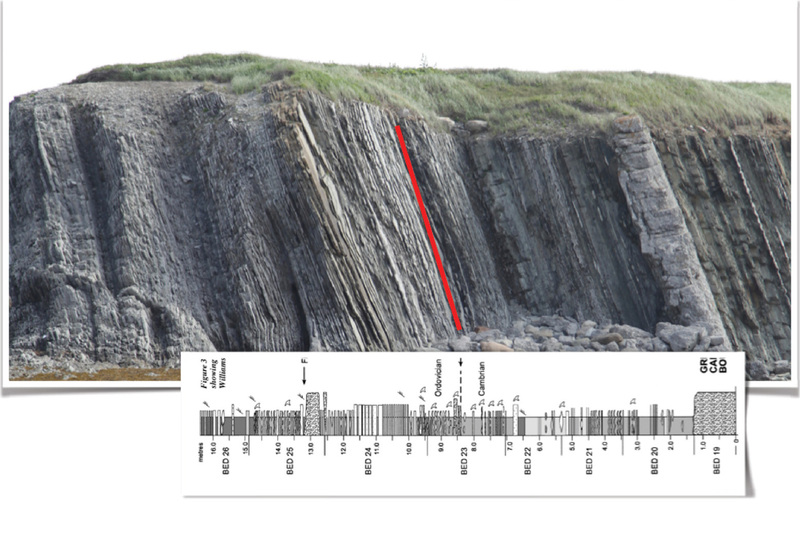 Williams 2001 “Global Stratotype Section and Point for base of the Ordovician System. Episodes, Vol 24, no.1. Just as individuals speak colloquially of “crossing the line” or “drawing a line in the sand” or even “invading our personal space” to mark various limits (and points of transgression), so too socio-political entities create borders, erect boundary markers, declare and define limits. Limits for time, limits for physical space, and limits which identify places, things, and people. But these limits are rarely – if ever – truly fixed or static: they are essentially arbitrary and subjective creations that fulfill specific needs at a given time, and are also often subject to forces beyond their creators’ control. Boundary|Time|Surface thus presents an intervention within the landscape that simultaneously inscribes the human impulse to define and contain things much larger than ourselves, and the arbitrary nature of such actions. 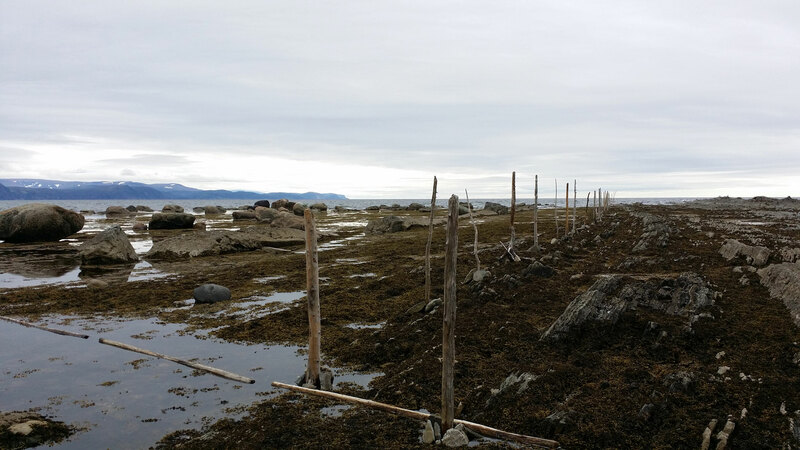 This work was created over a single four-hour period during the falling tide on June 22, 2014, on the shore at Green Point, in Gros Morne National Park, Newfoundland. The installation consisted of 52 found driftwood poles and roughly 300 rocks, all from Green Cove and Green Point, moved and positioned by hand in advance of installation day by me and my assistant, geologist John Waldron. The installation itself was built collaboratively by me, John, and 6 additional volunteers: Anne Marceau, Michael Burzynski, Renee Martin, Lisa Liu, Shawna White, and Ryan Lacombe. The work was 150 metres in length when completed, and the poles ranged in height between roughly 1.8 to 2.4 metres. Evidence of its existence remained at the site for approximately 48 hours: 34 poles has been felled by the tide by sunset on June 22 2014; 5 remained standing on the morning of June 23 2014; and one remained on the 24th. Copyright 2014, Sydney Lancaster. All rights reserved. Blog posts about the project can be found here, here, here, here, and here – and you can find interviews regarding the project on Arts East and Creative Gros Morne. This work was made during the “Art in the Park” Artist in Residence Program, an initiative of Parks Canada and The Rooms, St John’s NL; the artist gratefully acknowledges the support of the Canada Council and Parks Canada for this Residency program. The artist gratefully acknowledges the Alberta Foundation for the Arts for their support in developing the documentation of the original project for exhibition. Boundary|Time|Surface is being exhibited for the first time at the Discovery Centre Gallery in Gros Morne National Park, just outside Woody Point NL. This is a multi-media, installation-based body of work exploring (and expanding upon) many of the concerns underlying the creation of the original installation. This body of interrelated work considers different scales of time and types of memory; by extension, Boundary|Time|Surface is an extended visual meditation upon our relationship to the land and place, time, and the ‘how’ and ‘why’ of the ways we organize our lives. Some writing about the exhibition cane found here and here.